Look down the row of tables here in Day 1A @HPTPoker @Gates_Poker Main Event and there's a definite connection between them. 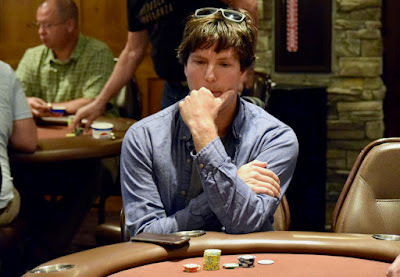 @Mawkswell Young, Yotam Shmuelov and Marty Gorenc - all in the 8 seat at their respective tables - played last week's WSOP Circuit series at Thunder Valley in northern California. Young (pictured) made three final tables - 9th in Event 3 Single Entry; 5th in Event 10 6-Max Turbo and 5th in the High Roller - to finish 4th in the Casino Champion race. Gorenc is a regular in series events at Thunder Valley and also the HPT Main Events here at Gates Poker Room. Shmuelov - who has played a number of California HPT events - is making his first run at HPT Gates.